Flowers- They enhance the image of a store, consumers walk in to something that is pretty, smells great and builds the notion of fresh. Produce- To create a tempting sensory experience. "Stores need to communicate to shoppers that produce is fresh or people won't buy anything." TIP- Reach to the back or top to buy the freshest. Buy produce during the week, since most deliveries are Monday through Friday. Bakery- "The bakery gets your salivary glands going, this makes you feel hungry, and the hungrier you are the more you buy." TIP-Shop after a meal or have a snack before you go. Grab-n-Go Items- To get back business lost to convenience stores. Bank- To get more money in the hands of the shopper, so they will spend it. TIP- Set a budget before you shop or bring a calculator(I do this) to keep a running tally. Endcap displays- Product manufacturers pay for prominent "endcap" placement- on the ends of the aisles- to advertise a new or popular product. TIP- These displays don't always mean a discount, a lot of times, these displays are only new items or in season item. "Retail-tainment"-Free sample stations, demonstrations and displays, slow you down while also exposing your to new products. TIP- To avoid unnecessary hunger-driven purchases, head right the the free samples if you arrive at the store on an empty stomach. Deli/Coffee Bar- If you're hungry for lunch, you will shop in a hurry, but if you have lunch in the store you will stay and relax, thus going back to buy a little more. Pharmacy- If you are filling a prescription, you need to wait, spend more time, and pickup another item to purchase. TIP- Drop off prescriptions before you start shopping to minimize idle waiting. If possible, call ahead with the pill order, so you can run in and buy it right away. 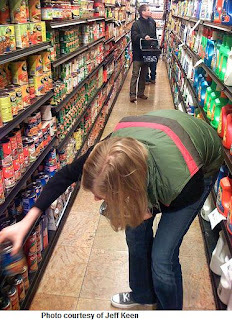 General merchandise/canned goods- They draw the shopper deeper into the store and expose them to nonessential items along the way. TIP- Stay focused by making a list. Dairy products/eggs/meat- Stores typically put these items in the farthest reaches of the store to expose shoppers to the maximum amount of product on their "quick trip" so they will buy impulsively. TIP- Take eggs and milk from the back of the case for the freshest, older merchandise tends to be pushed forward. Registers/exits- To turn waiting time into buying time. this is the most profitable area of the store. TIP- Express doesn't always mean faster. Studies have shown that the wait in the "express" lane is almost identical to the regular check wait- 3minutes 11seconds. Top-- Smaller brands, regional brands and gourmet brands. The top shelf is usually chosen by the store management. Shelf 2/3 (going down)- Best sellers and other leading brands. This is the "bulls-eye" zone and the manufacturer's may have paid for this space. There's no advantage for the supermarket to show your the lowest-priced item in the most effective spot. TIP- Look below the target zone for similar products for a lot less. Kid's eye level- Products with kid appeal are here. TIP- Leave the kids home if possible. Bottom- Store and private label brands, oversize and bulk items. 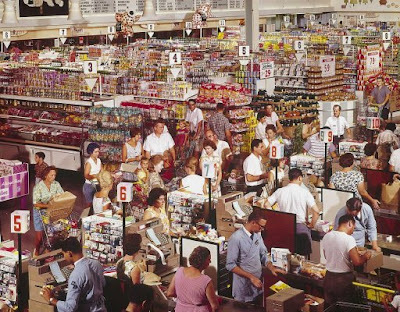 People who buy store brands will always hunt for them, so the supermarkets can place them out of the line of sight. TIP- Many times the same manufacturer that makes the branded product often make the store brand as well. And when buying bulk items, don't go overboard and end up wasting the food and money. Placement of items in a grocery store is turning into a major industry of its own..Very relevant post. Great tips! I really enjoyed this post. Thank GOD that our days off are on Tuesdays and you're absolutely right----it is LESS crowded on that day!